Last week, Haddon Heights’ part-time zoning officer sent out an unknown number of notices warning residents they are in violation of the Camden County borough’s sign regulations. 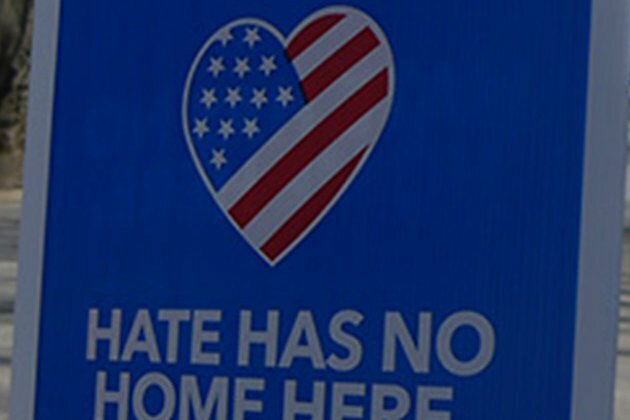 Targeted were some – but not all – homeowners who displayed "Hate has no home here" signs for more than 21 days in the South Jersey town. On Tuesday, residents will have the opportunity to tell officials just what they think of the warnings at a 7 p.m. council meeting in Borough Hall, 625 Station Ave. According to municipal ordinance, signs are allowed, but "in no event shall such temporary signs remain in place for a period exceeding 21 consecutive days in any calendar year, and in no event shall such signs exceed 24 square feet in size." Violation of the ordinance carries a maximum penalty of a $1,250 fine and 90 days in jail. But officials hastily backed away from the warning notices last Thursday, the same day zoning officer Ron Newell sent them out, after officials were peppered with calls from peeved residents, the news media and were targeted by online criticism. The mayor, Jack Merryfield, who was aware the warning letters were going out – he had read the text before they were delivered – and the solicitor, Albert Olizi, who was caught off-guard, quickly agreed there would be no immediate enforcement of the borough's sign law. 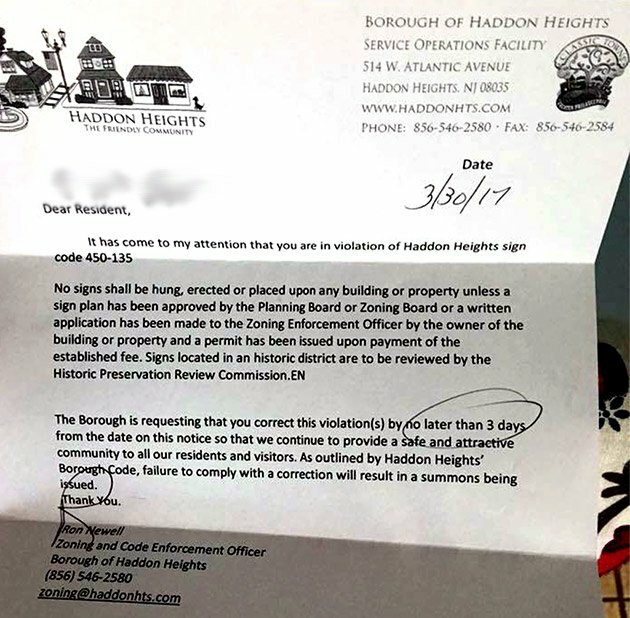 This letter from the town zoning and code enforcement officer went out Thursday to Haddon Heights residents who had “Hate has no home here” signs on their front lawns. Some residents, including a member of borough council, have contacted PhillyVoice to claim politics and selective enforcement appear behind the notices. Some say they intend to raise questions at Tuesday's meeting. After putting enforcement on hold last week, the mayor said: "No disrespect was intended. It's what the ordinance says. I'm sure there will be an outcry at our next meeting and we'll take a look at it. The code official was not picking on anyone." Newell, the “code official,” did not respond to a request for comment on Monday. It isn’t clear if Newell will attend the council meeting. PhillyVoice will cover the meeting and file a report Tuesday night.